When planning your vacation in Branson, our Branson, MO on the lake vacation rentals are beautiful, well-furnished, and without a doubt a perfect way to spend your vacation in the heart of what makes Branson so great! With easy access to the lake and incredible amenities, you'll find that choosing a Branson Lake vacation rental is a great way to have the time of your life while on your Branson vacation. Trust us; you can't go wrong with these incredible vacation properties! 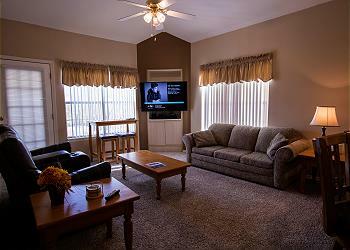 Click below to see our best vacation rentals in Branson, MO on the lake, or read on for more information! Lakeside living is an experience unlike any other. Waking up each morning to the sounds of the birds chirping happily and the waves splashing gently against the shore as the sun slowly rises over the horizon is something you will surely want to experience firsthand. Spend long days fishing, boating, and playing in the calming waters; even rainy days have a certain charm, as the drops beat against the roof of your vacation home and splash into the choppy waters nearby as you sit under a covered porch, sipping coffee and reading, napping, or engaging in conversation with the family. There’s no need to DO anything when you are living on the lake, and when you choose one of our Sunset Nightly Rentals Branson lakeside vacation homes or cabins, as sad as you will be about having to return to real life, you are guaranteed to come back recharged, rejuvenated, and restored. With Branson, MO on the lake vacation rentals from Sunset Nightly Rentals, you’ll have your choice of accommodations that will suit your family. 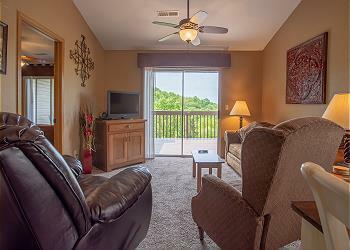 We offer a large selection of vacation rentals in Branson on the lake, from cozy condominiums to luxury homes. Instead of having to spend your vacation in the tiny confines of a regular hotel room, with vacation rentals you’ll have plenty of living space. Imagine having separate bedrooms and full living rooms to enjoy. You will even have fully equipped kitchens where the chef in the group can prepare mealtime favorites. Many lake property and cabin rentals in Branson MO offer quick easy access to the Tri-Lakes of the area- some even have private docks on the waterfront! 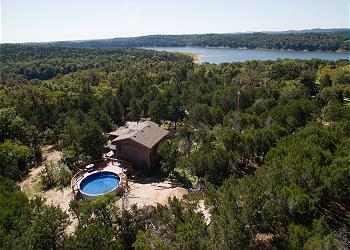 The three major lakes in the Branson Tri-Lake area are Table Rock Lake, Bull Shoals Lake, and Lake Taneycomo. These lakes offer fishing, boating, and many other water activities. You can enjoy fishing for largemouth bass or rainbow and brown trout. Take an evening, and enjoy a dinner or entertainment cruise. Have the group discover a nature trail or an afternoon of exploring the lakes by boat before returning to our cozy and spacious vacation rentals in Branson MO on the lake. Within these conveniently located vacation properties, including cabin rentals in Branson MO, you’ll find that each one offers comfortable furnishings and all the amenities of home. You can sit back and relax with an evening of just watching some television or enjoying some quiet time with a book. 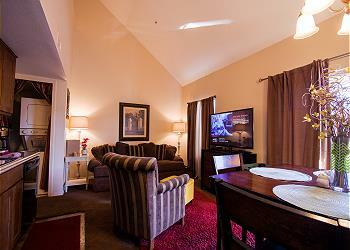 The comforts of these rental cabins in Branson will make coming back after a day in Branson a real treat. You and your group will be able to relax and enjoy some relaxation or planning your next day’s adventure. Another great amenity offered by many of our Branson vacation rental is that they are pet friendly. Your furry, four-legged family members can enjoy a great vacation along with you! Wood floors, comfy furniture, and unbelievable lake views await you when you rent this charming Branson rental condo located on the banks of Lake Taneycomo. Enjoy a cup of coffee on the deck each morning before heading into town for a hearty breakfast at Farmhouse Restaurant; be sure and bring your appetite, as their servings are large and their biscuits are made fresh every day! On days where you want to explore, there’s plenty to do in Branson. Visit the Hollywood Wax Museum and be amazed by the attention to detail. Bring a picnic lunch (supplies can be purchased at the Country Mart) and hike along the river that runs through Stockstill Park. Sunsets can be enjoyed back at the Branson cabin before hitting the streets for a night of fun and entertainment with a show; The Golden Sounds of the Platters with Eddie Stovall is a good start! It’s all about having a roaring fire in the fireplace on cold nights, enjoying lake views from your bed, and family time spent playing games on rainy days or gliding across the lake in a rented boat with a towel wrapped around you like a blanket against the chilly lake air. This is what your Branson vacation in our Lavish Lake Escape condo is all about: lazy mornings enjoying homemade egg burritos with supplies bought from Harter House Supermarket, lunches at Mel’s Hard Luck Diner, hiking the Chinquapin Trail, or taking in a show (or three!) in downtown Branson. Puttin’ on the Ritz is our latest favorite, but we are fickle and our tastes change daily! When you rent lake properties, or any of our other great rentals in Branson, MO, our experienced staff will do everything they can to make your stay enjoyable. Just ask if you would like help getting tickets to area attractions or activities. We can help you make restaurant reservations or even secure tee times! Contact us today for more information! 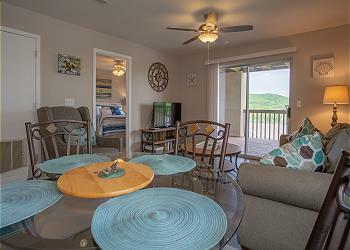 Book this 2 bedroom, 2 bath condo located at Fall Creek Resort for your next family vacation. Relax on the enclosed porch and take in the beautiful views of Lake Taneycomo. 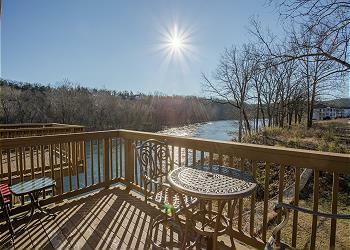 This condo is just a short walk to Fall Creek Marina! 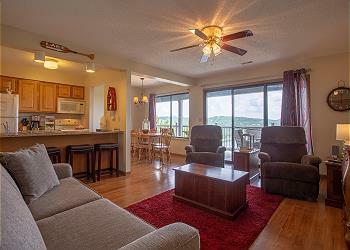 Enjoy some well-deserved peace and relaxation in this pristine lake front condo! 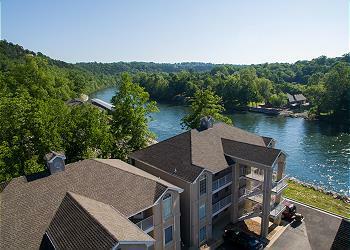 Cast off to a lovely 2 bedroom condo with beautiful views of Lake Taneycomo, located at Fall Creek Resort! 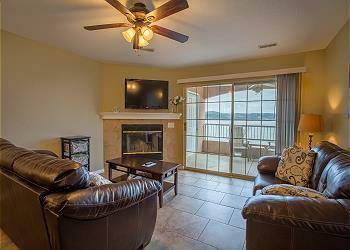 Fun is never fleeting when you stay at this comfortable 3 bedroom lake-front condo!